Muscles straining, mouths grimacing, bodies glistening, guttural grunts … And no, I'm not referring to the wildlife at The Big Pineapple, but rather the human daredevils … gliding, sliding and precariously balancing through the tree tops, at the brand new Tree Top Challenge on the Sunshine Coast! Are you daring? Do you love to get your adrenaline pumping? Then, get ready to push your fears to the maximum at the Tree Top Challenge on the Sunshine Coast. This amaaa..zing Adventure Park takes you sky-high with at least one hundred challenges plus twelve ziplines, all precariously perched in the treetops, more than twenty-five metres above ground level. Zipline over water ... for newbies like me! The Sunshine Coast Tree Top Challenge Adventure Park is located at the Big Pineapple, boasting challenges featuring five totally unique courses, starting off 'easy' and working up to 'heart-pumping extremes'. Entirely new and different challenges and obstacles have been brought to the Sunshine Coast Tree Top Challenge Adventure Park, making it unique to the Tree Top Challenges in Mount Tamborine and Currumbin. The Sunshine Coast Tree Top Challenge Adventure Park is surrounded by eight acres of the most luxurious green rainforest. Those in the know claim it to be much like the dense green of the Daintree in Far North Queensland and in my humble opinion could quite easily compete. I felt like I was participating in an episode of 'Survivor', it was that jungly! All the challenges at the Adventure Park are self-paced, which means you can complete each circuit at your own speed. The first two Green courses are the 'easy' ones and designed for every member of the family to enjoy … from the littlies to the adults. These two courses have been created so that adventurers can get a 'feel' for the rainforest surrounds, whilst building their self-confidence of being up so high. The third course steps adventurers' involvement up a notch with mammoth ziplines, ninja games, soaring heights and opportunities to face personal fears at every turn. Hair-raising stuff? Should adventurers cope all too easily with the first two course's obstacles, then the ultimate final two Black circuits await. Tree Top Challenge Adventure Park on the Sunshine Coast believe that these final two courses are the absolute highest and totally mind-blowing, rope courses in the whole of Australia. With this in mind, the two Black super challenges have been designed for ages fourteen and over, knowing that adventurers will need to step out of their comfort zones and possibly ... even beyond! All visitors to the Tree Top Challenge at The Big Pineapple can explore the first three humungous courses as many times as they wish, as long as they are aged eight and over and can reach the minimum height requirement. The ultimate two extreme Black Diamond courses are only accessible to adventurers who can reach 180cm to the palms of their hands, with both hands stretched above their head. Should children under the age of fourteen achieve this necessary height requirement, they will be permitted to attempt the Black Diamond courses, as long as they have purchased an 'adult' ticket. A certain level of fitness is required to complete these courses in order to climb through the trees. Participants should allow approximately thirty to forty-five minutes to complete one circuit and three to four hours to complete the entire Sunshine Coast Adventure Park. 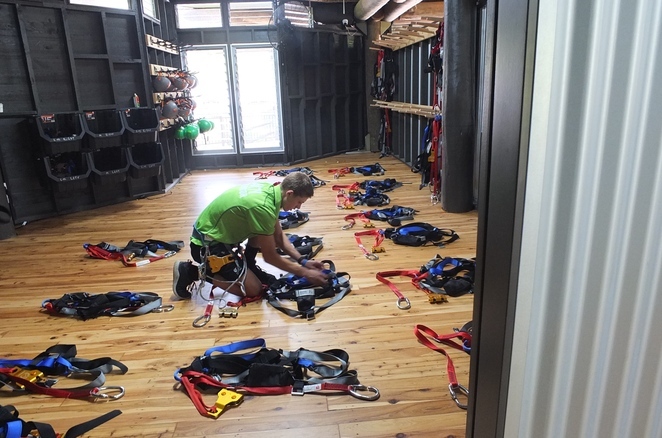 Adventurers have safety briefings before embarking on their tree-top adventures, with the highest grade safety equipment and state-of-the-art smart belay system ensuring adventurers' stay safe at all times. Small camera or phone to capture some awesome memory-making pics - device needs to be small enough to secure in a pocket with a zip. The Tree Top Challenge operates in all weather conditions, except in lightening storms or high winds. Adventurers' safety is of the utmost priority, so if a session is cancelled by the Tree Top operators, visitors will be eligible to a full refund. The day adventuring hubby and I visited the Tree Top Challenge Adventure Park at The Big Pineapple was rather an impromptu visit. To my delight, it was very busy and even though we hadn't pre-booked, we were able to explore and enjoy all the tree-top fun, without actually getting off the ground. Bookings are absolutely essential and can be done online here via the Tree Top Challenge website. For Tree Top Challenge ticket prices, which range from $45 per individual or $43 per person, with groups of ten or more, please click here. I have bookmarked the totally awesome Tree Top Challenge Adventure Park on the Sunshine Coast for my next lot of visitors, when they come to holiday with us on the Sunshine Coast. Keep a lookout for my follow-up article on actually 'being a tree-top adventurer'. The Tree Top Challenge Adventure Park is part of the initial and very innovative revamping of The Big Pineapple area, making it more appealing and accessible to tourists and locals alike. The Tree Top Challenge Adventure Park is the perfect activity for team-building, school outings or birthday parties! Every wannabe-gladiator can expect to have a thrilling day out in nature, conquering personal goals, having a heap load of fun, whilst being immersed in spectacular lush green tree canopy views, all thanks to the Tree Top Challenge Adventure Park at The Big Pineapple. Another excellent article and photos Elaine. You are so lucky to live in such a beautiful part of the world Elaine. I can never manage to get enough time up that way so keep the great articles coming! Well done on another silver! Such a great venue for family, friends and team building.